A ten years old software! Need to Host your FUDForum Forum? 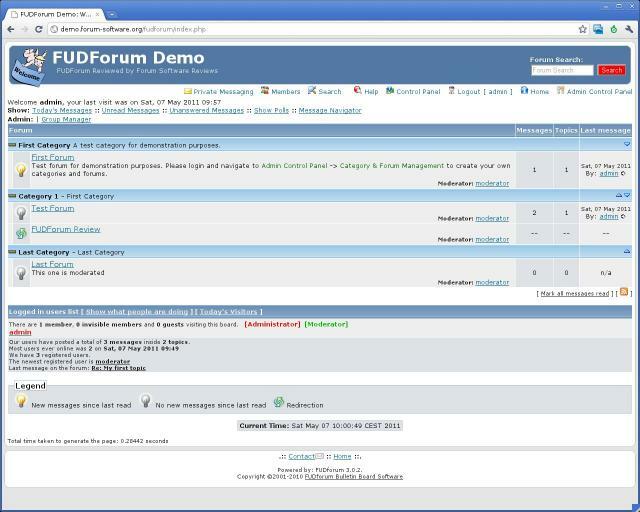 FUDforum, or Fast Uncompromising Discussion Forum is a complete forum package, with a quite impressive list of features. Its developers insisted on the ease of use of its administration panel and on the general usability of the forum. September 10, 2011: Update FUDForum Review with 3.0.3. May 5, 2011: Update FUDForum Review with 3.0.2. March 10, 2009: This review has been updated for the 2.8.0 release of FUDForum. August 24, 2006: First Review. FUDForum is recommended for Huge Community. FUDforum ships with more than 50 official translations as part of the default installation. FUDforum is localized on translatewiki.net (site that localizes Wikipedia), and you can consult the FUDForum project page and translation status. FUDForum is a classical forum software, and can be installed on LAMP server or Microsoft IIS, with a MySQL backend and a PHP extension. Spell Checker can be enabled if your PHP installation contains the PSPELL extension, in the Global Settings Manager. Same for the detection of duplicated threads, which is not enabled by default. FUDForum is also one of the only forum fully supporting Mailing List. Once integrated with a mailing list, it is even possible to post new messages through an email box. To enable Friendly URLs, simply set the PATH_INFO setting to true (Global Configuration / General Settings) and use a template based on the path_info feature. However, note that these friendly URLs are not that friendly, as they contain cryptic IDs, not human-readable, unlike the classical topic/title you may find in real friendly URLs. Some details about FUDForum features regarding members. Shadow Topic, which are links to a topic that has been moved on its original position, are available on FUDForum, that even let you defining how long the link should be displayed. Look for Moved Topic Pointer Expiry in the Global Settings Manager for more information. It is possible to limit the publishing of links in message under a given number of posts submitted. A really nice feature to avoid one-post-users, often full of spam. Convert an existing forum to FUDForum. directory). What other forum can do that! As usual, the task scheduler is quite important for planning important tasks, like backups, consistency checks, sitemaps generation, tables optimization, new forum versions checks, USENET posts importation, Mailing List Messages importation, etc. A template engine is also present, and even if it might be considered by some as a bit archaic, it is functional, and anyway, there is plan for improving it someday. The Official FUDForum Converters Section provides several way to migrate an existing forum platform to FUDForum. Secunia Advisories severity affecting FUDForum. Secunia Advisories impact affecting FUDForum. LDAP integration is supported using the LDAP plugin. If you need something more specific (like plug in FUDForum with your internal intranet applications), FUDForum provides a Login API. FUDforum can import RSS, RDF, Atom formats, as well as supporting USENET protocol and e-mails, which makes it particularly useful for integrating external data. More details on the Syndication Management page. Does FUDForum correctly follow (X)HTML and CSS norms? FUDForum is a classic and good forum software, which provide many features by default. Since FUDForum 3.0, the installation system and the general process of updating is now more usable and easier. Once installed, it clearly provides many controls to your forum, with hundred and hundred of settings to tune precisely your installation. Of course, the inherent consequence is that the Administration panel and configuration parameters list could be difficult to interpret and use for new users. Syndication, private messaging, moderation and FAST Template using make this forum software as good as a standard phpBB 3, with nice adding and surprising features, so do not hesitate to use it for your community! We cannot conclude without speaking about FUDForum support of mailing list and Usenet, as it's really rare to find a web forum supporting this way of discussing (that, unfortunately tends to disappear in the benefit of web-only applications). Compare FUDForum vs PhpBB 3 vs Simple Machines 2. Ask your questions to the FUDForum Community Forum. Get Users Reviews about FUDForum and Share your experience. Friendly urls can be enabled by editing the current theme and using something called PATH_INFO instead. Thanks for your reply, you are right, it works pretty well. I've updated the review with this information. “Fast Uncompromising Discussion Forum” software! Dare to be different, FUDforum is not for everyone but if you are an independent minded person who wants it your way, do it the FUDforum way. "You will also need to make a copy of your configuration file if you want to install it on a Windows platform (FUDForum needs symbolic links)." This statement is inaccurate: sysmlinks are not required at all! FUDforum will only use symlinks on Lunux/Unix platforms and only if it isn't disabled by the host. FUDforum 3.0.0 is already available. This review needs some serious updating! This review is so full ridicules statements and inaccuracies it's not even funny!!! Okay, but instead of complaining, why won't you try to explain what is "so full of inaccuracies"? I think it would be more interesting for FSR and the entire community as well. I am sunsettommy.Who just got an e-mail today.Despite that it was dated back to April 18. The e-mail was about my one time log in.To then make a new password.It failed totally.Still can not log in. Then I tried to get a new password sent to me from the log in box area.It never send me one by e-mail. How about DELETING my account instead? I am tired of this absurd run around. This is now fixed, so if you still have problems, do not hesitate to report them. Its really a nice information you have posted here. I think you are right here. Keep it up. Do you say FUDforum does not have hidden topics because you don't see a forum setting that says "hidden" on it? Is that the criterion that must be met to say whether or not a forum software has hidden forums? If so, that's short-sighted. There are at least two ways to hide forums in FUDforum. 1) Delete it. It goes into the "trash can" and is hidden until it is assigned to a category. 2) Set permissions so it is not visible to whatever group of users you want to hide it from - for example if it should only be seen by Administrators and is otherwise "hidden," if only the Administrators have the visible flag set then only Administrators will see it - bang, it's hidden. Extending the "hidden by setting it not visible in group permissions" thing to the category level - if all forums in a category are not visible, the category is also hidden. Actually almost any script available on the Internet to empower a website includes RSS functionality, whether we are speaking of a forum, blog, CMS or even social networking software. However, the nature of forum websites should be put aside to analyze carefully its potential. In addition to the Posts by email ability, it has mailing list integration (http://cvs.prohost.org/index.php/Features#Mailing_List_and_NNTP_Integration). All posts in a given forum can be sent to a mailing list, and all emails in the mailing list will be imported into the appropriate forum. I need this functionality in order to replace the mail2forum software I'm currently using with phpBB2. It's development has stopped and I need a replacement forum software and mailing list integration. So far I've found just this on and Phorum. The current release is 3.0.4 - no "rc"
It now has a user "karma" feature, whereby users are rated on the quality of their posts... In addition to assorted feature enhancements & bug fixes. In fact, almost all the scenarios available on the Internet web site includes features RSS, this is a forum, a blog, CMS software or social network. However, the nature of our sites should be delayed to carefully analyze their potential.